Once the main plumbing lines are installed to the utilities for the neighborhood, the trench is filled and the front re-graded again. The long pipe sticking up in the picture is the sewer clean out that will have a cap next to the ground. If the sewage system were to become blocked, this would be the first point to clear it up and the last link from the house to the utility. Chronic flooding and moisture problems in your basement is one of the most annoying, not to mention costly, dilemmas you would have to put up with as a homeowner. This is especially true if you live in a flood-prone area. There are many factors that contribute to this problem: a faulty drainage system, lack of water downspout, and improper grading, etc. Fortunately, there are a number of preventive actions you can take. 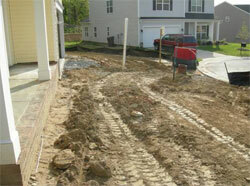 One such way is by grading your ground so that water flows in the direction away from your property's foundation. If you want to save money, instead of hiring a contractor, try these time tested ways to grade your property correctly. First, determine whether your yard has the correct slope. You can do this using two means: the traditional stick-and-yarn method or the water level method. If you are working on a smaller piece of property, say a 30 x 30, the water level method will do. For much wider areas, the stick-and-yarn method has been recommended. In order to complete the test, you will need a bucket, a long hose, and water. To do this, fill the bucket halfway with water and place it on the highest point of your ground. Measure the water level by sticking a ruler next to it into the ground. Attach a hose into the bucket, siphon, and cover the other end of the hose with your thumb. Walk to the lowest part of the ground nearest your home, holding the hose, and stick a ruler on this end. Put the hose face up adjacent to the ruler and wait for the water to come out and incur a mark on the ruler. Once all rulers have been marked, string the rulers together, deduct the height of the water in the pail, and you get your reference height as the basis of accurate levelling. Now that you know how much dirt to add on the slope towards the direction of your house, you may start digging and filling in dirt until you match your reference point. You may also want to increase the dirt fill a bit to create a higher slope so when rainwater falls, the water flows away from your foundation and out to the yard and beyond. This process should be done part by part. First, plunge wooden stakes, 12" off the ground, into the following areas: one next to a corner of your house, one at your property line, and one on the opposite end of your house. Connect each point using a yarn and a string line while making sure the string is level from all angles. You will now be able to see whether your ground slopes toward or away from your house. Once you have determined the need for re-grading, go to a rental shop and rent a skid loader. You may want to hire someone to do the digging and dragging using this humongous machine but if you are in for adventure, you may just ask the rental company to do a demo so you can just do it yourself afterwards. When you do the job yourself, make sure that you do not go lower than the level of your sidewalk. Once you have completed one area of your property, re-position the stakes and cover the remaining areas. Repeat the procedures from above until you finish all areas of the house. The ground may look messy after this process, but in time, the grass will grow back into its glorious shape and you can enjoy your lawn once more, without the usual water worries.